I’m one of fi ve in my family. Growing up, when we took a road trip to anywhere it was never a peaceful time for my mother. A station wagon full of kids aggravating each other for the whole of the ride. I was reminded of those memories this past week when our new bees arrived. 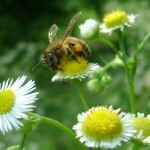 Every year we order new packages of bees in anticipation we may lose some over the winter. Our bees are shipped up from a bee farm in Georgia. As we were getting them acclimated in their new home I was wondering what the trip had been like for this poor queen. And thought of my mother and these family trips. I imagined this queen who is raised with all other queens in their own special hive. Being groomed on how to be a queen. Doted on all day, being fed royal jelly, having her stinger sharpened, giving directives, and not having to lift one single finger (or leg) for anything. I envisioned it being like Wonder Women’s Paradise Island for honeybee queens. Then all of a sudden their island is filled with smoke, confusion everywhere and each queen is snatched up, forced in a little wooden cage with a just a few of her servants and put into a box with 7 to 10 thousand new ‘common’ bees. 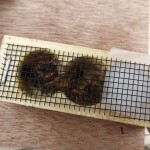 And these ‘common’ bees too have just been separated from their familiar colony and are in a strange place with a new queen. There has to be confusion and stress everywhere. This box of bees is then packed up onto a truck and makes the long trip up from Georgia to Connecticut. For the whole ride this queen who was living the life of luxury minutes ago is now trapped with all these bees frantically trying to get to know her. I just imagine a 20 hour car ride with a million questions! Where we going? Are we there yet? I have to pee. He’s poking me….. We’ve all been there. Once they make it to their new home, the new colony is still not completely familiar with each other. This ‘cage’ the queen is in has a sugar plug at one end. The purpose of this is to give the colony time to get acquainted to their new queen while they eat through the sugar to release her. Personally, I think it’s more to give the queen time to get used to her new role and not high tail it out of there the second she has a chance! I also wondered… who thought of putting this queen in a cage? And how many poor queens were devoured by their new colony before this experimental beekeeper figured out they need time to get used to each other? The whole process is amazing to me. 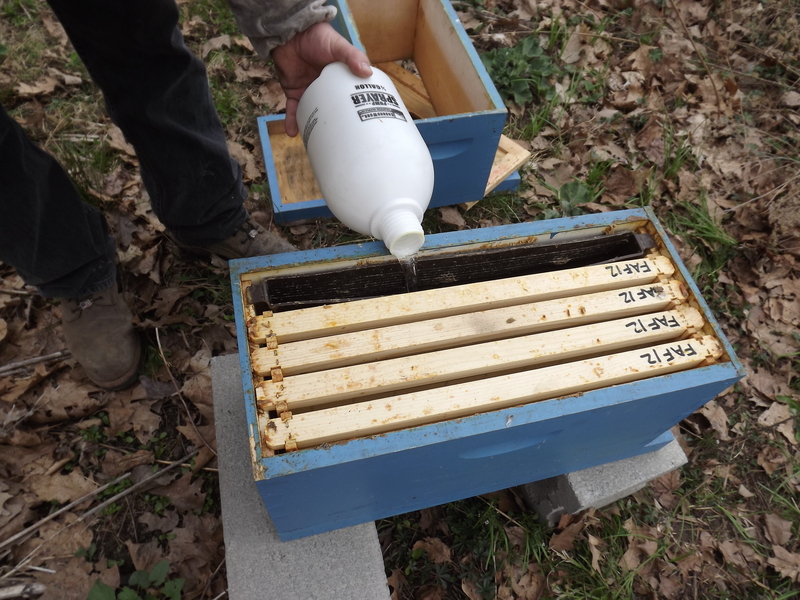 From the creation of the colony to the maintenance of the health of the hive, how the colony works together, the honey collection process, every single bit of it. And each year I continue to learn more and love to share! More to come….. Some exciting news for the farm, the Cambridge House has made another brew with our honey. This time it’s a Honey Porter and I can tell you that it is excellent! Our honey is now available at the Windsor Chamber of Commerce (great for gifts). And we’re featured in a mini documentary on small businesses in Windsor. Check it out! I have to give a special thanks to Keith who performed the interview, filmed, and edited the piece. He got stung in the eye while he was on the farm. Apparently our bees are not fond of being on camera! 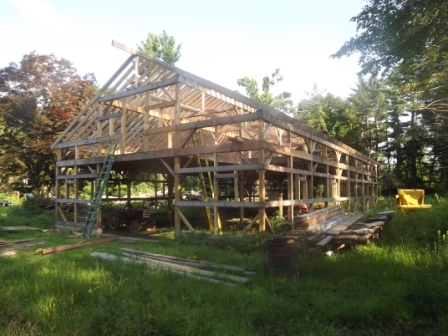 We’ve been working diligently on the barn and making progress. It’s quite an experience having the opportunity to build a structure from the ground up. Like anything else, when you are part of the creation, you have more respect for it. I read a quote recently from John Ruskin. He said “Old buildings are not ours. They belong, partly to those who built them….” Our barn will be old one day. I end this blog with a request. Right around Christmas time I was in line at a coffee shop. A gentleman several customers in front of me bought his coffee and then gave the girl a twenty and asked her to buy the line coffee for as much as the twenty would buy. When I got to the register I gave her more money to keep it going. While I was walking out I said to myself wouldn’t it be great if I came back in the afternoon and people just kept paying it forward all day? I went back that afternoon and had to buy my own coffee. My point is, even though the Holidays are over, it’s okay to have that ‘Holiday’ feeling all year. 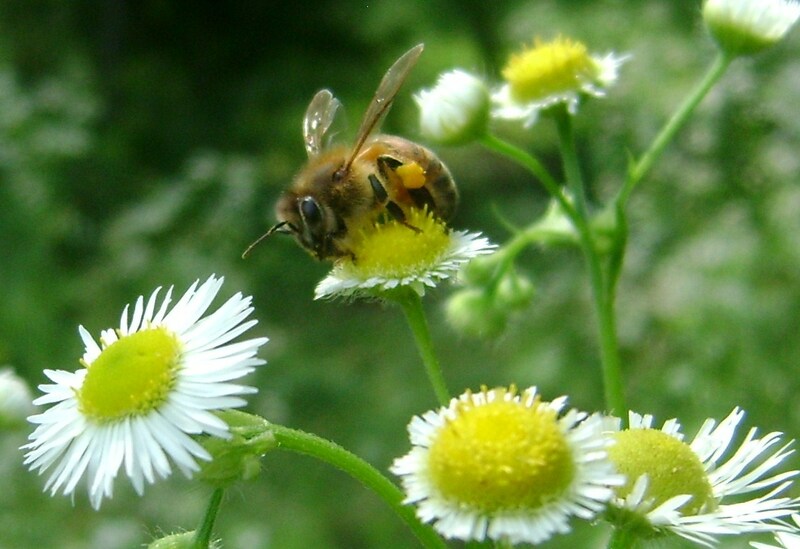 One thing we can learn from our bees is the value of being a community. Help each other, take care of each other and in doing so, you will be part of a much stronger force. Well, better late than never! It’s been a busy fall and realized I need to blog before the Winter Buzz is due! 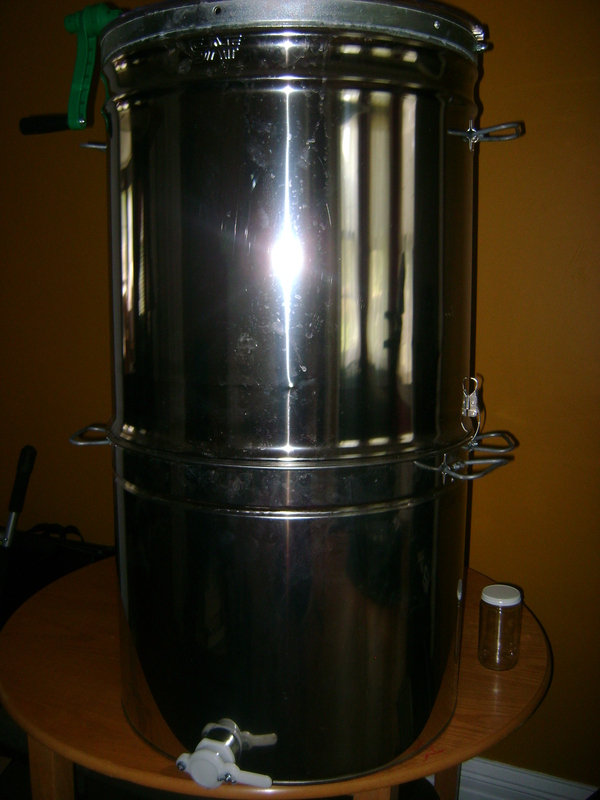 The honey is in and we had a great year! Crops are all harrowed up, the last of the vegetables are canned and put on the shelf for our winter consumption and our direction changes to begin to prepare for winter’s arrival. Funny how many think on a farm the fall is a time to start winding down for a winter break since it’s no longer the growing season. Have you ever thought about how much time we spend in New England preparing for the next season? 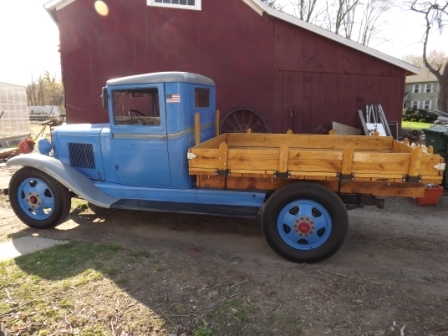 Now it’s time to get bee’s ready for winter, tractors ready for snow, split a whole lot of firewood, the list goes on and on……There is no break! At any rate, we’ve had a great Fall and are excited to share some news! We made many new friends being in the Windsor Farmer’s Market this year and look forward to seeing everyone again next year. We also participated in the First Church Vendor Fair, the Wade and Tea Fair, and the Save the Windsor Locks Train Station vendor fair. Thanks to all our patrons who continue to support us and shop local! You can now find our honey product in the specialty Honey Wheat Bread at our local Bakery in Town, Get Baked, and at a specialty brew at one of our favorite places to eat Cambridge House in Granby. We’re also excited to say our popular Honey Blueberry Jam is now Award winning! It won a blue ribbon in the Jam Contest at the Big E. This was our first time entering a contest, next year we plan on entering our Honey Jalapeno and Honey Strawberry Jam. We finally got the barn going and have added more pictures to our farm living page to document the progress. It’s getting there….one board at a time! 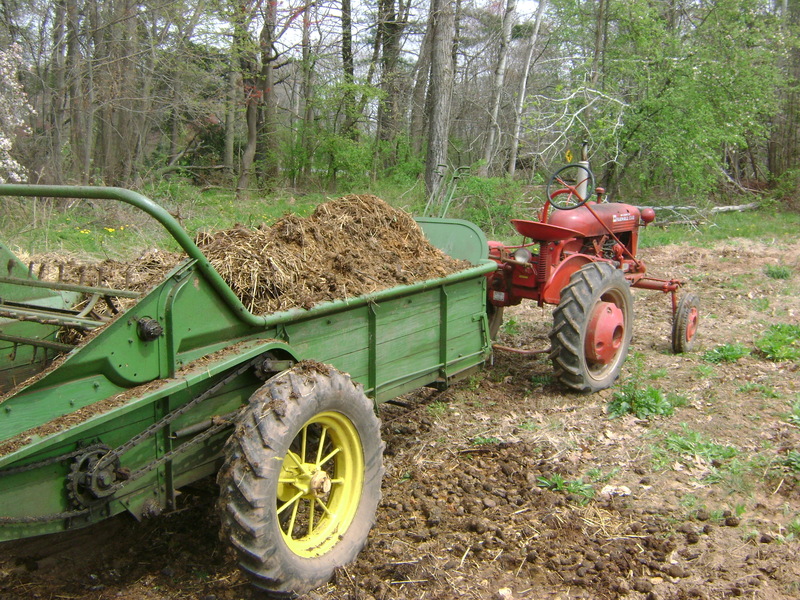 10 Signs You Just Might Be a Farmer….. The first sign of spring is when we no longer have to keep the fire going to keep the house warm! 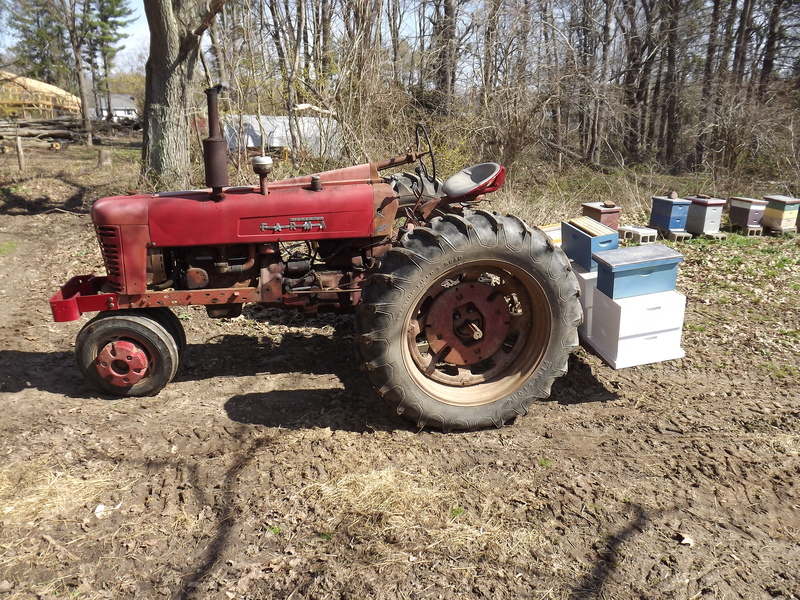 Spring is here when bees begin working and when the goats start to shed, flowers begin budding, crop plans are set and seed has been ordered. Spring is new life, and it’s exciting! 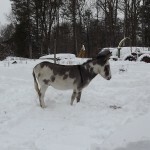 We’ve plowed and harrowed the fields, started planting, and have extended the animal’s grazing area. We’re still on the fence about kidding the goats or raising chicks , but have added more hives to our apiary. 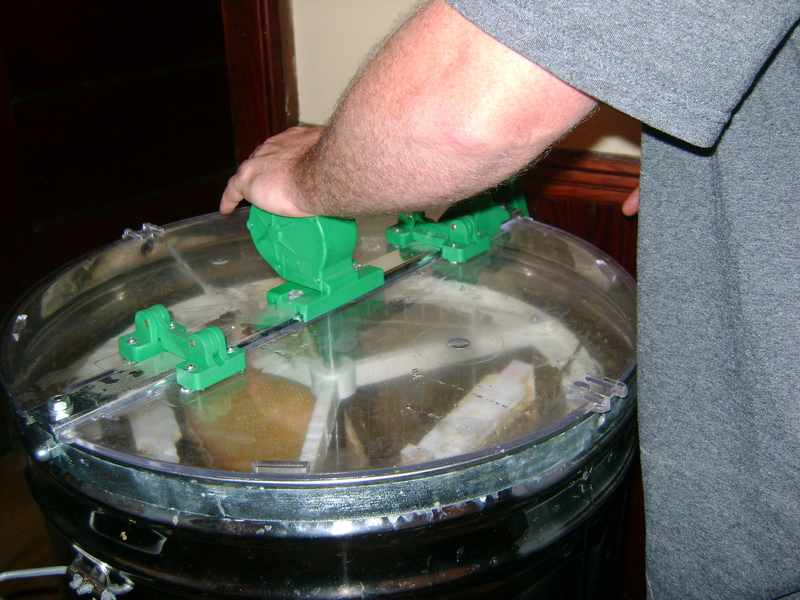 We will also have an observation hive to display at fairs and events this year. We recently spoke about the farm at the Kiwanis club, participated in Earth Day @ Northwest Park, and have been accepted into the Windsor Farmers Market – check our calendar for dates. Our barn is still “in progress” and we plan to have our honor system stand back out as soon as veggies start coming in. 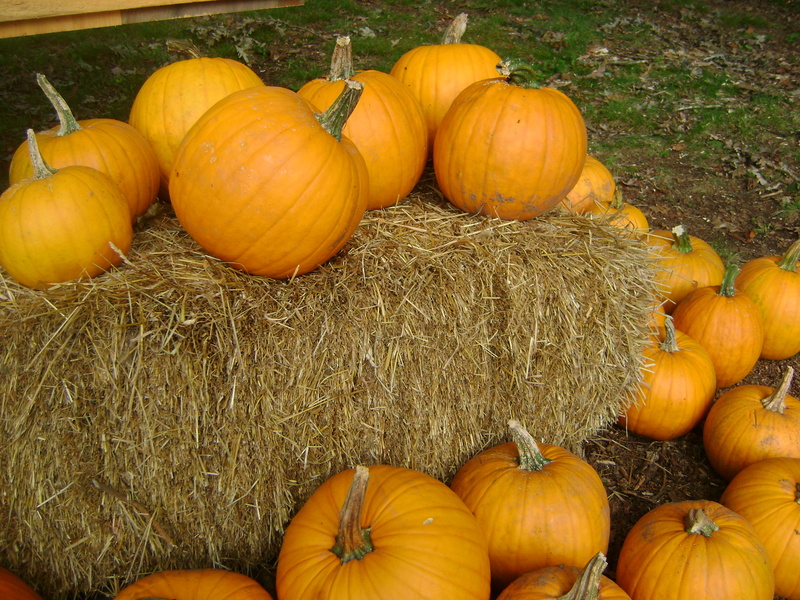 We want to say thank you to all our loyal customers who continue to support our local farm! We have a new addition to our farm family. Meet Peso! 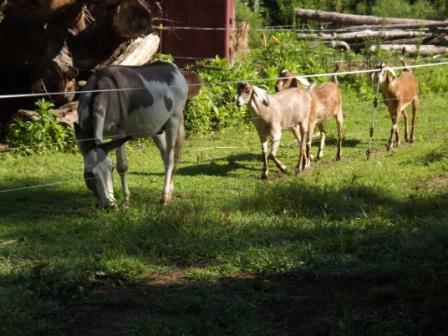 Peso was added to help protect the goats from any predators. 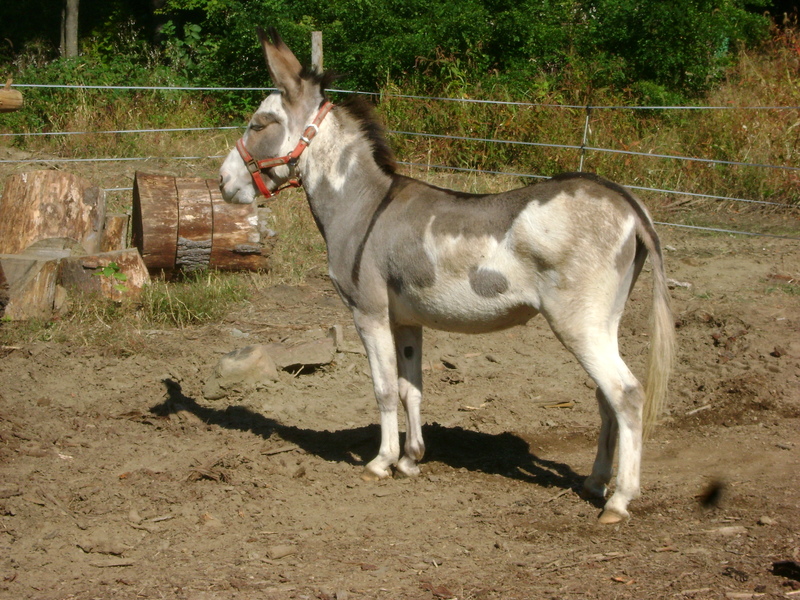 It took a good week and lots of braying before the animals were used to each other and Peso was comfortable in his new surroundings. I’m sure our neighbors are happy they are all settled in now! We had a spectacular Holiday Season and hope you did as well! Although the Wade and Tea Fair show was cancelled, we were still able to participate in the Mother Daughter Tea Function sponsored by Windsor Chamber of Commerce and hosted by Bart’s Beanery. We donated honey and jam and spoke briefly to the attendees how honey is made. We also participated in the Shop ‘til You Drop, First Church of Windsor, Clover Street, and Trinity School Vendor Fairs. It was great to meet and talk to our local community, thank you again for all your support! We joined the Windsor Chamber of Commerce last month so look for specials and events throughout the year. If you haven’t signed up for the weekly WCC email to notify all What’s Going on in Windsor, check it out, there are a bunch of great activities! Our signature Muth Jar of Honey is featured in the Heart of The Country Boutique in Wethersfield, CT. And thanks to Bart’s Beanery for their support in purchasing the rest of our home made Honey Peach Jam and are now serving it in their establishment! For those who knew Eva who managed a road side stand up the street from our farm, she passed away last September. We’d like to thank her family for their support and generosity as they have passed on many of Eva’s gardening items to ensure her love and appreciation for gardening continues. Look for her alliums in the summer! We finally broke ground on the new barn! We are excited to finally get that project going. We have all the siding (which was milled from the trees on the farm) seasoning out in the yard and the foundation was just poured last month. We’ve added some pictures of the progress. 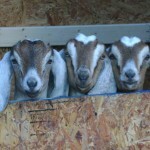 Once the barn is up our plan is to work on kidding the goats for milk and possibly adding chickens! After 2011 with record snowfall, an earthquake, hurricane, wettest year on record, and the October snow storm, let’s hope for a mild winter! Looking forward to the spring already! As seasons end, it brings both excitement and anticipation of what the new season will bring. With the approach of fall brings honey! When we extract honey, the whole house smells so sweet. It’s a great feeling knowing our reserves of honey have been replenished and I’m free to use honey at my will. No longer guarding the last bottle of honey from the previous extraction. So many have asked about the extraction process I wanted to respond here. The bee hives are made out of wood with wooden and wax frames in each. 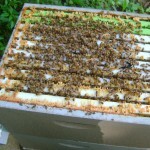 The bottom hive bodies are where the majority of the bees are along with the queen laying brood (eggs). 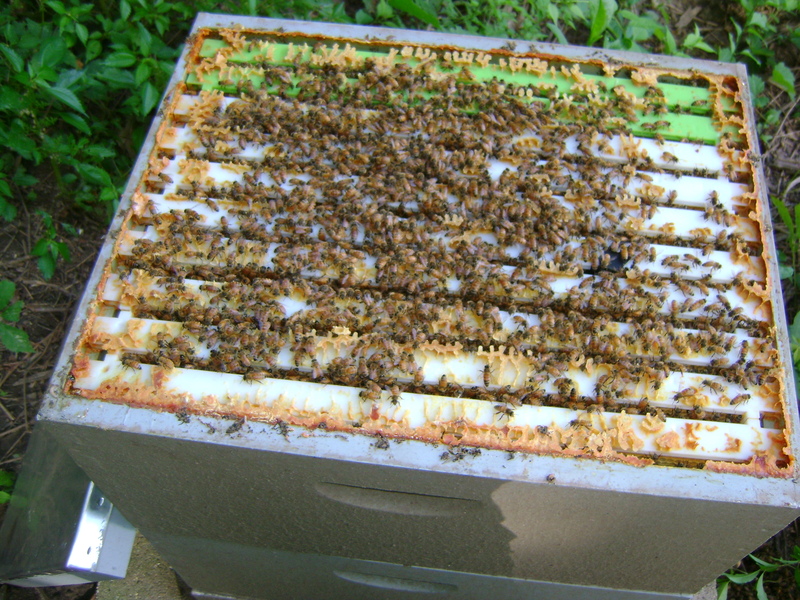 The top ‘hive bodies’, called supers, are where the bees store honey. When extracting, supers are removed. We have two types of frames. 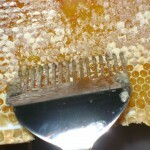 One is used to cut comb. 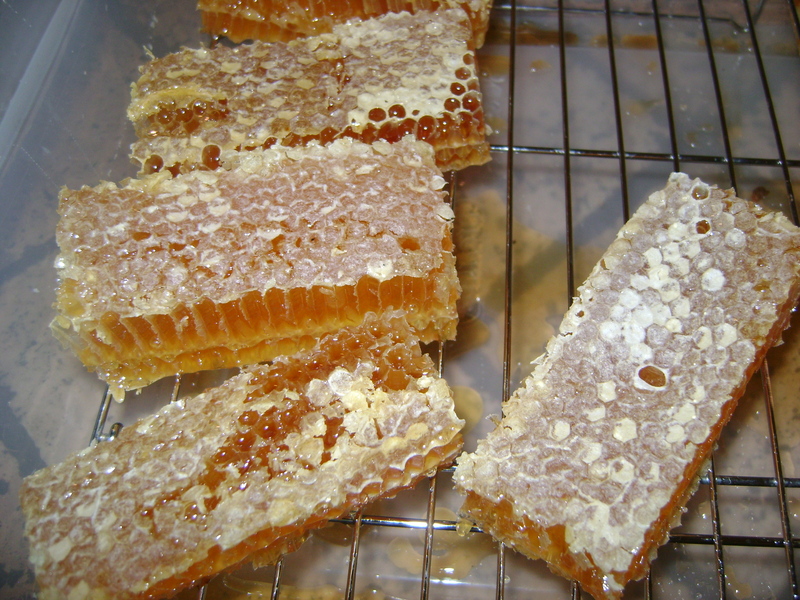 Many people love this as it’s honey that has never been exposed to air…..true raw and natural honey. 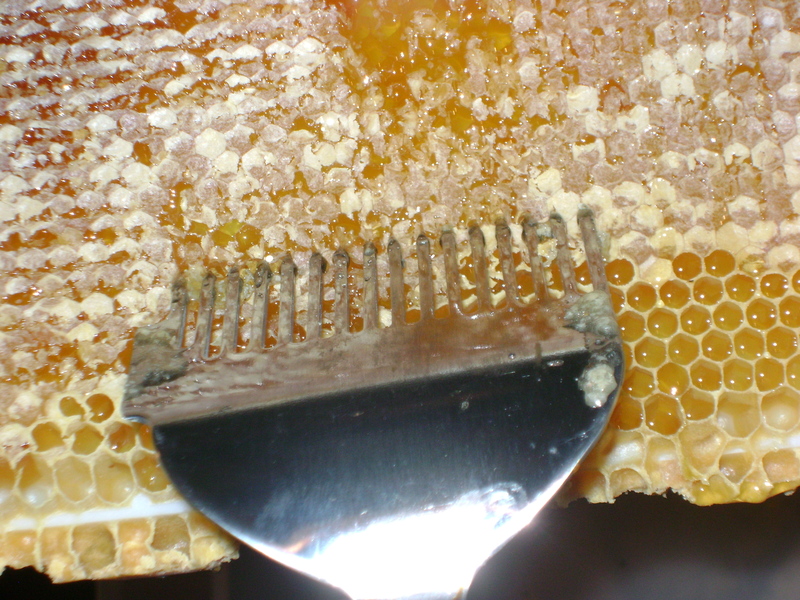 The other frames are used to extract honey by scraping the wax cappings on the comb to break them open. Then placed in an extractor. 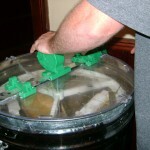 It’s kind of like a fan where it’s hand cranked and left to gravity to pull out the honey. 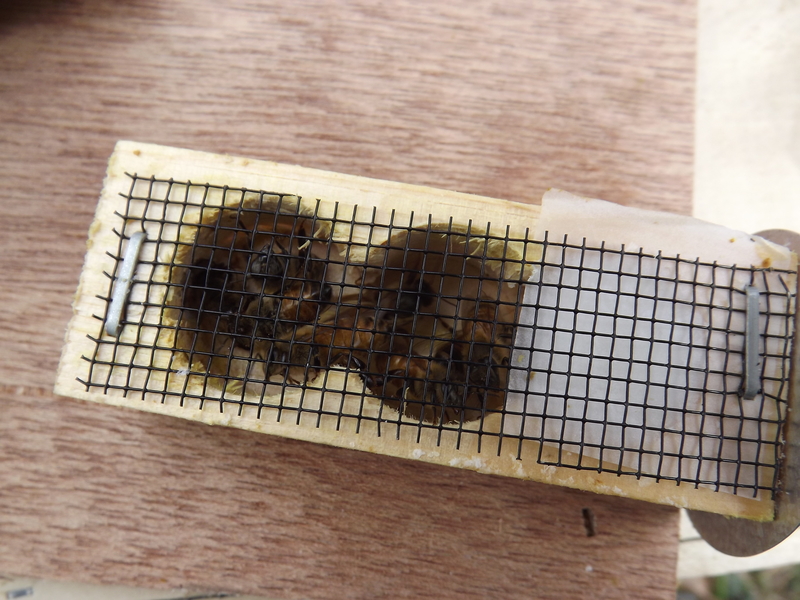 It’s then left for the honey to drip down through a screen to filter out any ‘bee parts’ or wax cappings. It’s then poured directly into our bottles. 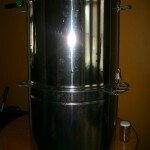 Oh, and the filter, that’s where the all the wax is captured and melted down to use in our lip balms and hand creams. 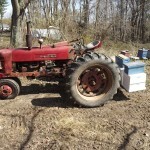 With fall beginning, we now attempt to get the bees ready for winter. We feed, feed, feed! Most people don’t know bees eat a sugar and water syrup when there is no nectar flow. Right now, we’re going through about 150 lbs of sugar a week! We have some new products available which we’re excited about. 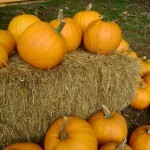 We’ve partnered with soapsbyjudy.com where we have supplied her with Forgotten Acres Farm honey and pumpkins and she’s made hand crafted soap. 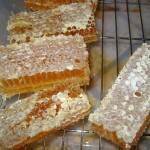 First Honey Bar Soap sold out immediately and the next batch of Pumpkin and more Honey will be available mid October. Perfect time for Holiday gifts! We continue to experiment with new products and are busy getting ready for the Wade and Tea Fair Show and a newly added Holiday Fair at First Church Early Learning Center in Windsor on November 3rd. I recently attended classes on social media. So look for us soon on Facebook! Again, thanks to all in supporting our success! The fruits from our labor are prospering! We have 650 pumpkin plants that are bearing fruit. Our garden is thriving and we’ve had our veggie stand up for a couple weeks now which is getting more and more popular every day. 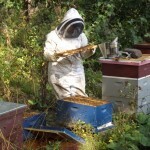 The bees are working and we’ll be extracting honey the beginning of September. Last year, in an effort to resurrect a barn that used to occupy the property, we started clearing the land. We’re proud to announce the stand is the first product erected from the wood which was taken down, milled, seasoned, and built right here on the farm! I’ve added some pictures of the veggie hut on the Farm Livin’ page. I’ve taken a safe handling food class which allows us to offer jellies, jams, and sauces. Our first, with great reviews so far, is our Blueberry Honey Jam. We’ve signed up for the Wade and Tea Fair which will be hosted by Windsor Chamber of Commerce In November 2011. Hope to see you there! During this adventure of reviving the farm, so many have come forward with support and encouragement. I’d like take the time to say “Thank you” to our ‘testers’ who have supplied invaluable, honest, feedback which assists us in perfecting our beeswax products. To Rich who we just met, brings a supply of bread for the goats. To our sister Aileen, Cousins Ed and Gene, the employees at ATI Stowe Machining, and to everyone who stops by the Veggie Stand and leaves a note or stops to talk! It’s encouraging to know there is so much interest and support in local farming. Lastly, a huge “Thank You” to Suzie. A couple of weeks ago while working in the field, Suzie stopped by after her niece found us on the internet and told her the house she grew up in was being revived. I was ecstatic to be able to talk to someone who was intimate with the house and its history! As I gave her a tour of the house, she shared stories about the people, the house, and ghosts! Not only was I able to find out more information on the house then I ever imagined, she stopped by later on to give us pictures of the house in its day and the original fireplace equipment! It doesn’t take much to make me happy…..scoring the corner piece in a brownie pan, finding five bucks in my jeans, but this definitely takes the cake! Again, thank you to everyone for taking the time to read and show your support! 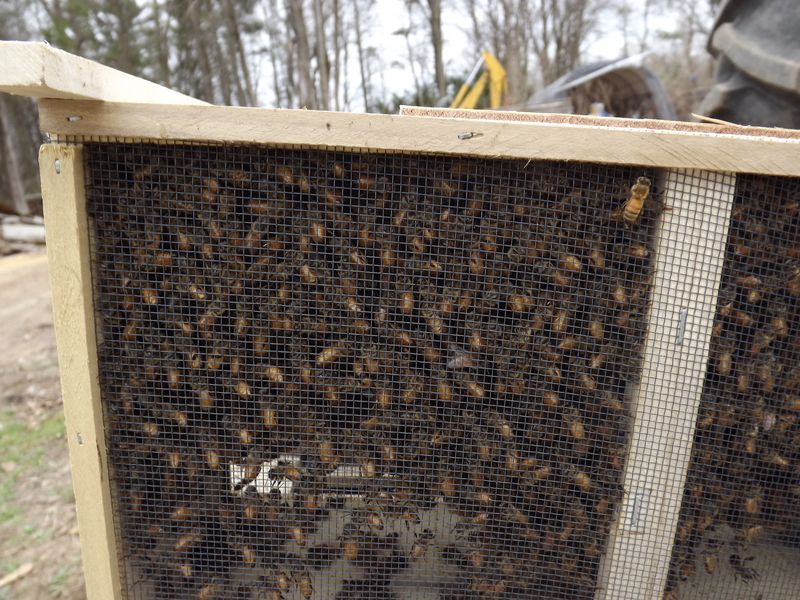 The bees have arrived and are ‘beesy’ working! They’re making themselves comfortable in their new home. I must admit, I never actually had to transport bees, so this was a whole new experience for me. The bees travel in what’s called a package. It’s kind of like a screened in porch the size of a shoe box. I was assured the bees have no interest in anything other than getting at the queen who is like a caged go-go dancer inside the package. 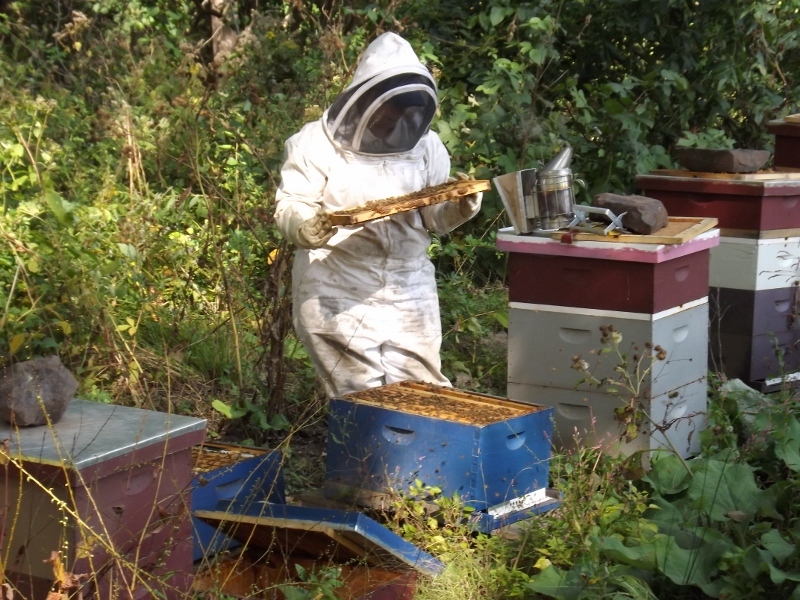 With that said, I decided against wearing my full beekeeper suit for the hour and a half drive to get them home. Honestly, it wasn’t bad at all. But, starting out, it was like driving in a snow storm…..white knuckled, sitting upright, full attention, no radio, hands precisely at 10 and 2 on the wheel. Continuously looking in my rearview mirror making sure none of the seven packages of cargo decided to venture out to explore their surroundings. It was a little eerie with just the sound of bees humming inside the car! None the less, we made it safely home without any mishaps. 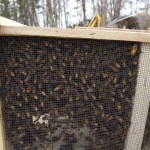 Aside from the bees, we’ve been extremely busy around the farm. Our on-line store is finally up and open for business! We’ve been creating 100% natural lip balms, hand creams, and candles. (Thank you to our ‘testers’ for helping us make a good quality product!) We even made a solid beeswax perfume and lip balm with customized labels for party favors for a kid’s birthday party. Yes, we can accommodate custom labels for parties, stocking stuffers, corporate events, etc.! We’ve been milling wood from the trees taken down on the property, planted some apple trees, and have been growing vegetable plants in the coldframe for planting. 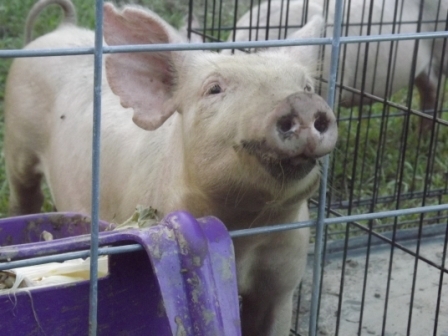 Lastly, we’re proud to welcome Dixie, Daffodil, and Viola to our farm family! 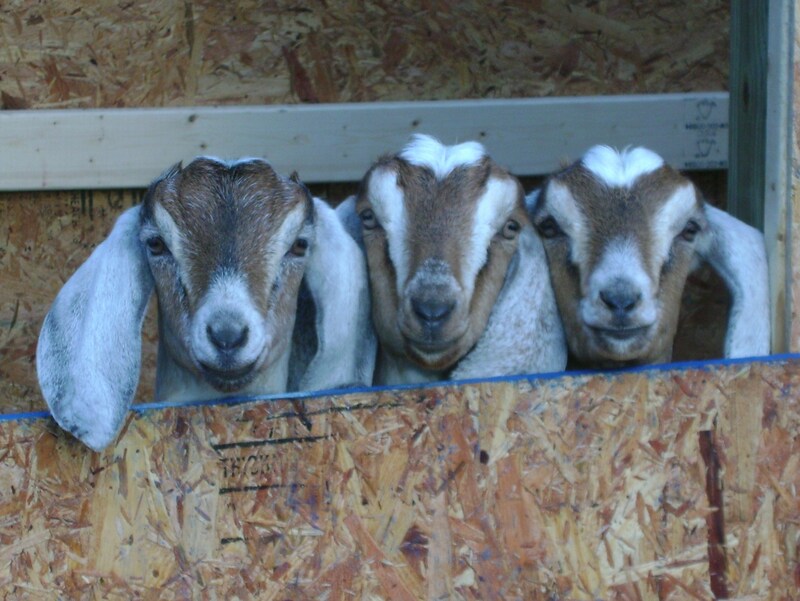 Next year they’ll be providing our community with fresh goat’s milk, cheese, and goat’s milk beauty products. Right now they’re providing entertainment with their ‘kidding’ around. Please stop by our Farm Livin’ link on the site for more updated pictures. Thanks for following us and the continued support!